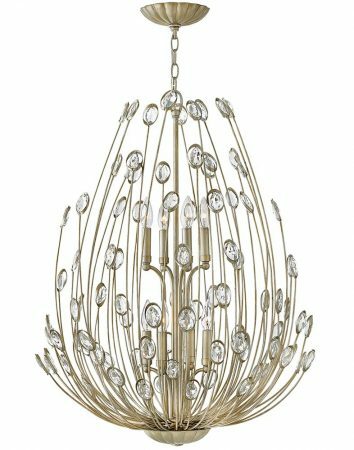 This Hinkley Tulah 8 light two-tier chandelier in silver leaf with crystal detail is contemporary and boasts a multifaceted asymmetrical design. Featuring a shell ceiling cup, chain suspension and central rod supporting the frame. A bouquet of different length curved stems sprout from a lower shell and feature faceted crystal insets that sparkle when lit. An eight light candelabra hangs in the centre, with four candle style lights on two tiers that create the perfect amount of sparkle. The Tulah’s multifaceted asymmetrical design is hand crafted and features artisan details. Its beauty unfolds in layers, revealing delicately scalloped canopies, a lustrous silver leaf and dazzling faceted clear crystal embellishments adding the perfect amount of sparkle. A true statement-piece that is suitable for a variety of interior styles. Perfect for a stylish bedroom, dining room, hallway or living room. Supplied with 183cm of suspension that can be shortened at the time of installation to achieve the desired drop; please see below for dimensions. There are coordinated fittings available in the Tulah collection that can be viewed below. This statement-piece ceiling light is supplied by Elstead Lighting and designed in the USA by Hinkley, founded in 1922 in Cleveland, Ohio. They have transformed from a small outdoor lantern company to a global brand intent on bringing you the best in style, quality and value designs like the Tulah 8 light two-tier chandelier in silver leaf with crystal detail featured here.